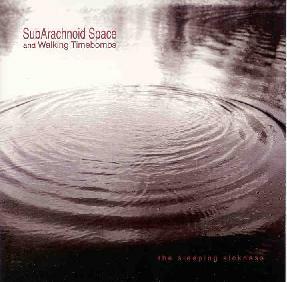 SubArachnoid Space And Walking Timebombs - "The Sleeping Sickness"
Though released earlier this year, "The Sleeping Sickness" was recorded in 1996 by the original lineup of SubArachnoid Space in collaboration with guitarist Scott Ayers of Walking Timebombs. The entire album is a massive blazing SubArachnoid Space noise-psych freakout. The sound is quite good with the various guitars easily distinguishable from one another but still blended into an aggressive sonic whole. The music is pained and aggressive with bass lines so low and droning you can feel the rumbling in your chest while the guitars simultaneously pierce your brain. The bass and drums march along at a thudding pace supplying the backbone for the guitar excursions that wail and scream in an acidic noise-fest that is dangerously corrosive. The guitars are the real stars of the show and parts even have a raw early 70's jam rock feel, but layered over the top are the wildest of shrieking guitars. Probably the weirdest track is "The Sleeping Sickness" which has a bit of a techno beat against a throbbing Stoner rock drone, and those freakout guitars stomping all over the place. Two guitars are blazing in each channel, the left and right each abruptly cutting out at various moments. Pulsating wah-guitars, wailing guitars, droning guitars, they're all here. The album does, however, finish with one of my true pet peeves... 20 minutes of silence followed by just a minute or two of music. Why???!!!!! In summary, SubArachnoid Space occupies the border area between exploratory guitar-driven Krautrock and acid psych on the one hand, and improvisational noise psychedelia on the other. For acid guitar freakout fans it doesn't get any better than this. Much of this reminds me of Farflung's more aggressive moments, though this is more in the noise-psych realm. Available through Elsie And Jack Recordings.